Latest concept drawing for new crossing of North Lombard at Fenwick/Concord. Note that “access control” likely refers to closing or narrowing driveways of adjacent properties. The Concord Avenue neighborhood greenway has only one gap in its 2.4 mile route between Overlook Park and North Argyle Street in the Kenton neighborhood: the offset crossing of Lombard Street (a.k.a. Highway 30). 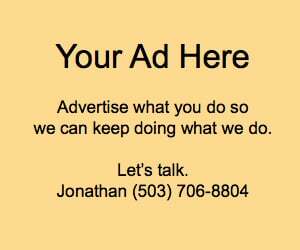 But with a new agreement between the Oregon Department of Transportation (they own and manage Lombard) and the Portland Bureau of Transportation, that gap will soon be filled. 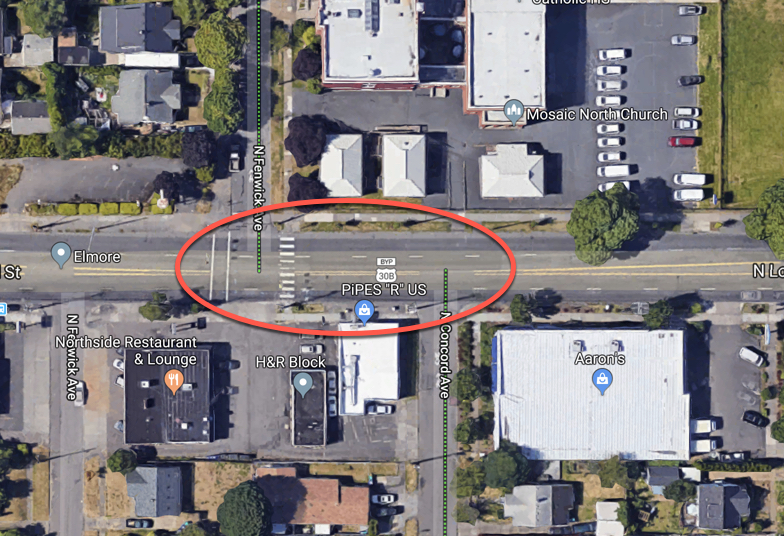 The two agencies recently hashed out an intergovernmental agreement (IGA) so that PBOT could do the work to build a new crossing that will link Concord on the south side of Lombard with Fenwick to the north. It’s a much-needed upgrade to an intersection isn’t as safe as it should be. Not only is this a designated neighborhood greenway route, but it’s a popular connector between two neighborhoods (Arbor Lodge and Kenton) and there’s a high school directly adjacent to it. Streetview looking west on Lombard. Concord is on the left, the half-signal and Fenwick are in the background. The existing crossing infrastructure — known as a pedestrian half-signal — is also not compliant with federal guidelines. A half-signal exists when there’s a standard traffic signal for the major road, but only stop signs for the minor roads. The Manual on Uniform Traffic Control Devices (MUTCD) explicitly prohibits the use of half-signals due to safety concerns. Studies have shown that when someone actuates the traffic signal on the main road, drivers from the side-street think it’s an opportunity to turn and they don’t realize (or they don’t see) the people in the crosswalk. As of 2015, Portland had 47 such signals and because they’re not recommended by the MUTCD, we haven’t installed one since 1986. PBOT plans to spend $2 million in Transportation System Development Charges to improve this crossing. In addition to the full signal upgrade they plan to add ADA improvements to the curbs and sidewalk, and create a new bike lane on Lombard. 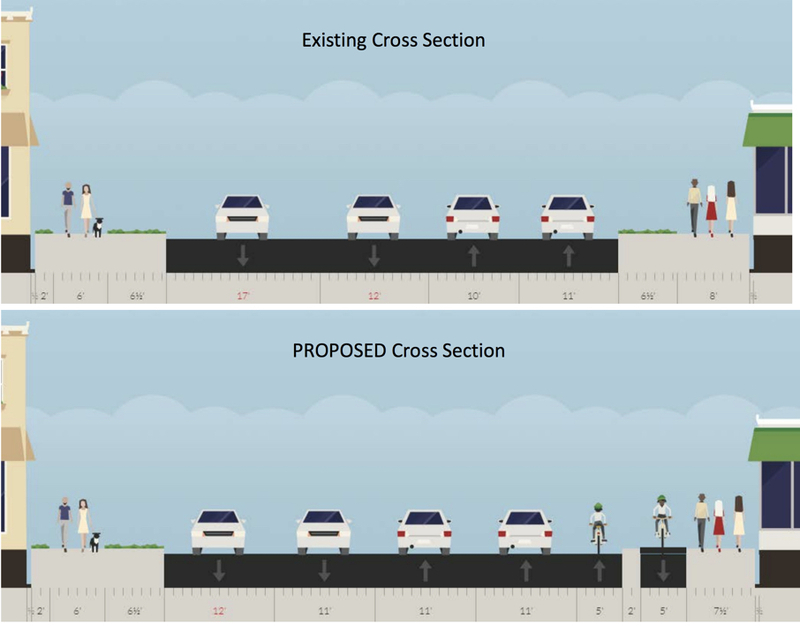 As you can see in the latest concept drawing, the plan is to stripe an unprotected, five-feet wide eastbound bike lane and create a westbound bike lane on the sidewalk for the short distance between Concord and the crossing at Fenwick. Longtime readers will recall that we first mentioned an improvement at this crossing in 2010. PBOT Communications Director John Brady said today that with the IGA with ODOT now signed, they can move onto final design work. It will be a few months yet until we get an estimated date of completion. Stay tuned. 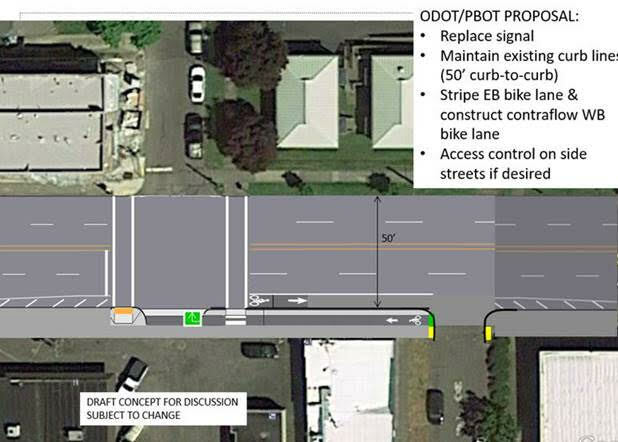 The post City, state will team up for new bikeway and signal on Lombard appeared first on BikePortland.org.